Our shop is SSL® protected and supports 99+% of all browsers. 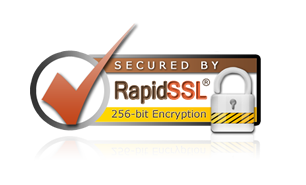 Data is encrypted up to 256-bit SSL. Secure Sockets Layer (SSL) is a protocol used to enable data encryption and site authentication on the Internet. Credit card numbers, health information, and other sensitive information are not transferred until they are converted to a secure code. Domain authentication assures site users that they are actually interacting with the site specified in the URL bar. Without SSL, online transactions would be vulnerable to interception by unauthorized parties. These hackers or identity thieves could also more easily mimic a legitimate website. SSL is most commonly used to protect communication between web browsers and servers. However, it is also used for server-to-server communication and web-based applications. Secure Sockets Layer (SSL) is a security protocol that requires a web server and a browser to work together to set up an encrypted channel for exchanging information with SSL. The seamless trust relationship between a browser and a server depends on the browser's ability to trust the SSL provider when the server and browser connect. When a web browser attempts to connect to a server secured with SSL, the browser requests authentication. The server sends the browser a copy of its SSL certificate. The browser checks to see if it trusts the SSL certificate. If so, it sends a message to the server. The server sends back a digitally signed acknowledgment to start an SSL encrypted session. Encrypted data is shared between the browser and the server. From May 25, 2018, the Basic Data Protection Regulation (GDPR) of the European Union (EU) will also apply in Germany. The new EU law directly supersedes the previous Federal Data Protection Act (BDSG) and the EU Data Protection Directive (Directive 95/46 / EC), on which the BDSG is based. At the same time a corresponding BDSG new version (BDSG nF) comes into force, which modifies the DSGVO in part and concretized. Please note that Internet-based data transmission has security vulnerabilities; A complete protection against access by third parties is thus impossible. We use on our site so-called cookies to recognize multiple uses of our offer, by the same user/Internet access holder. Cookies are small text files that your Internet browser stores and saves on your computer. They serve to optimize our website and our offers. These are mostly so-called "session cookies", which are deleted after the end of your visit. However, these cookies sometimes provide information to automatically recognize you. This recognition is based on the IP address stored in the cookies. The information obtained in this way serves to optimize our offers and to facilitate your access to our site. You can prevent the installation of cookies by setting your browser accordingly; however, we point out that in this case you may not be able to fully use all functions of our website. Alternatively, click on this link to prevent Google Analytics from tracking you. By clicking on the link above you download an "opt-out cookie". Your browser must allow cookies to be stored. If you delete your cookies regularly, you will need to click on the link each time you visit this website.